Dr. Elaine Coleman, the 2014 Zoetis Teaching Award recipient, led the commencement ceremony processional with the gonfalon, the college’s banner. 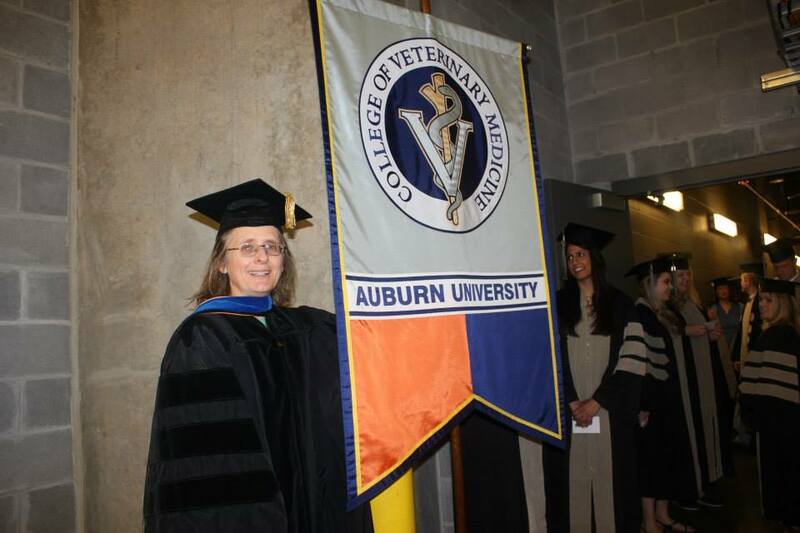 Elaine Coleman, an associate professor in Auburn University’s College of Veterinary Medicine, is one of two recipients of the Gerald and Emily Leischuck Endowed Presidential Award for Teaching Excellence. Dr. Jeffrey Katz, Alumni Professor in the Department of Psychology in the College of Liberal Arts, is the other recipient of this prestigious award. Dr. Katz’s research focuses on the comparative mechanism of learning and cognition. He has a history of teaching excellence and receiving research grants from the National Science Foundation and the National Institute of Mental Health. Dr. Coleman and Dr. Katz will be honored for their effective and innovative teaching methods, as well as a continuing commitment to student success, at the Faculty Awards Celebrating Excellence ceremony in early 2016. The faculty awards are presented by Timothy Boosinger, provost and vice president for academic affairs, and are the highest honors the university awards to faculty. Dr. Coleman, who teaches veterinary anatomy and neuroscience to first-year veterinary students, is a faculty member in the college’s Department of Anatomy, Physiology and Pharmacology. These courses are the most challenging and difficult classes for first-year veterinary students, yet Dr. Coleman’s teaching methods have earned her the highest teaching recognition awards. “I consider Dr. Coleman to be the best and most effective faculty member I’ve had the privilege to work with,” said Dr. Edward Morrison, head of the Department of Anatomy, Physiology and Pharmacology. 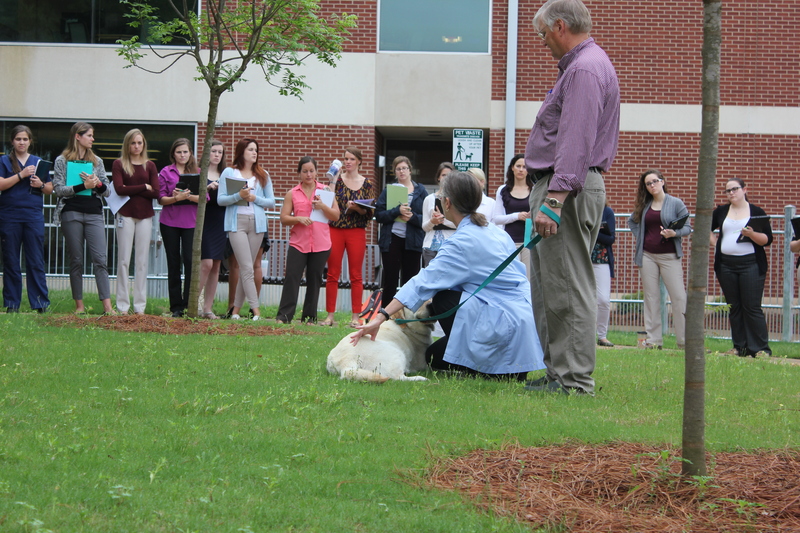 Dr. Elaine Coleman teaches first-year veterinary students an anatomy lesson with the assistance of her dog, Milo, and her husband, Dr. Dale Coleman. “Dr. Coleman demonstrates a profound knowledge of science that enables her to effectively span basic and clinical sciences. Her professionalism, dedication, style and method instill the life-long learning traits in the student that is the ultimate goal of all teachers. Dr. Coleman’s character, humility and integrity are characteristics often commented on by students and colleagues. She is also dedicated to mentoring junior faculty and to her academic research efforts in CNS astrocyte structure and function in brain disease, which has been funded by the NIH as well as private agencies. The Leischuck Endowed Presidential Awards for Excellence honor teaching excellence by Auburn University faculty who have demonstrated a commitment to student success through effective and innovative teaching and through advising and mentoring inside and outside the classroom. The awards are named in recognition of Gerald and the late Emily Leischuck, who fulfilled long-time professional careers in administration at Auburn, but started theireers as teachers who came to Auburn to pursue graduate degrees in education. While at Auburn, Emily Leischuck served nine years in student affairs programs, where she was Panhellenic advisor and assistant to the dean of women, followed by 12 years in the Office of the President. During those years, she served as assistant to the AU president and the Board of Trustees, retiring in 1995 with emeritus status. Long supportive of student organizations and a frequent leader in community-service activities, she was a 1996 recipient of Auburn’s Algernon Sydney Sullivan Award. Gerald Leischuck began his 35-year Auburn career in 1962 as a graduate assistant in the College of Education. Shortly after earning an Ed.D. in educational leadership in 1964, he joined the staff of what is now Institutional Research and Assessment. He served as executive director of that office from 1966-89 and as secretary to the Board of Trustees from 1989-97. From 1992 until retiring to emeritus status in 1997, he also served as executive assistant to the president. After retirement, he returned for two years as a consultant to the Board of Trustees.